MYIML operates a lead generation business calling consumers to sell solar panels and other green energy saving solutions. MYIML first came to the attention of the Information Commissioners Office (ICO) in November 2013 after it received a number of consumer complaints. It should have ended there, but MYIML continued to generate more TPS complaints. 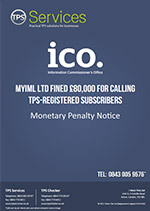 By January 2014 both the ICO and the TPS received further complaints about automated broadcasting and MYIML was asked to confirm its compliance with the Privacy Electronic Communications Regulations (PECR) to which it received a response stating that it made calls on behalf of a number of partners, that it purchased data from a third party and did not screen its data against the TPS. The ICO replied providing guidance on PECR and informed the company of its responsibilities in that regard and further that it should not make calls to people registered on the TPS without express permission from those individuals. Despite warnings, the complaints continued and MYIML met with the ICO in September 2014 to discuss how it was planning to ensure its compliance with PECR. Between 23 October 2013 and 17 July 2015, the ICO received 269 complaints about the Company. In approximately the same period, the TPS received 779 complaints. MYIML’s fine equated to £76.33 per complaint.